We live in such a rush every day that most of us tend to forget what a beautiful world is out there. Add to that all the bad news around and I think it becomes a case of people spending more time indoors "hiding out" than getting out there and experiencing nature. 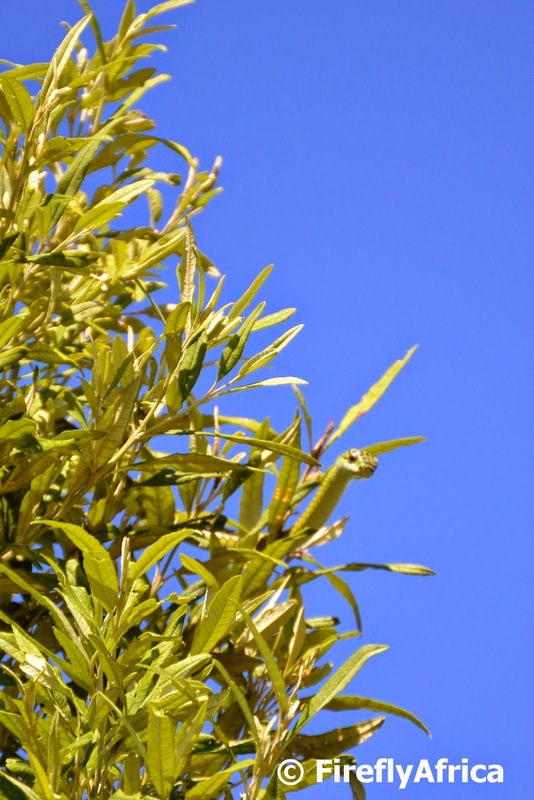 Earth Day was celebrated on 22 April and I spotted this video on an Earth Day blog post on the Getaway blog. How can I not use it in a post as well? Watch it and allow David Attenborough to remind you that we live in a wonderful and beautiful world. A quick three day visit to Cape Town for World Travel Market Africa had me slip out the exhibition at lunch time on day 1 to head down to the V&A Waterfront for a quick lunch. Well, probably more sightseeing that lunch (as if I've never been there but I am the eternal tourist). 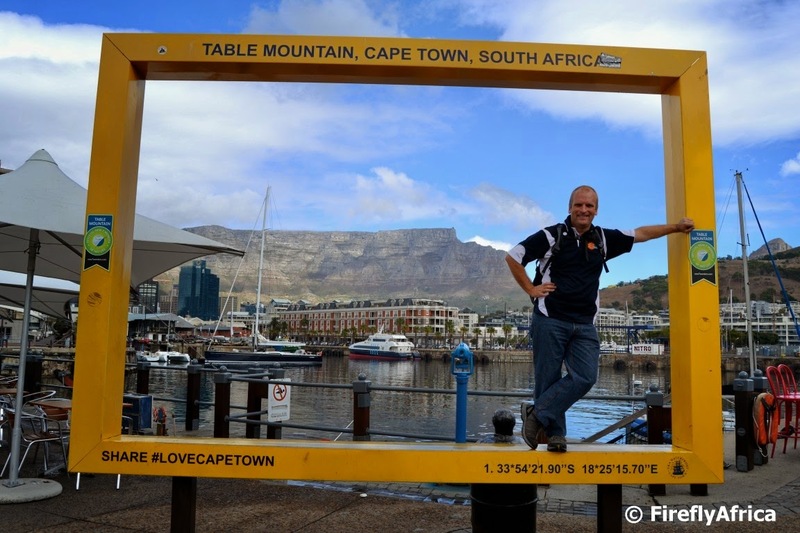 I ended up at the #LoveCapeTown selfie frame enjoying the view and before I knew it I was taking pictures for a German couple wanting to have a picture together. Then two Dutch ladies... and four from the UK. One of the UK guys asked if they could take one of me. Of cause they can. So here I am doing the Table Mountain selfie frame touristy thing at the V&A Waterfront. 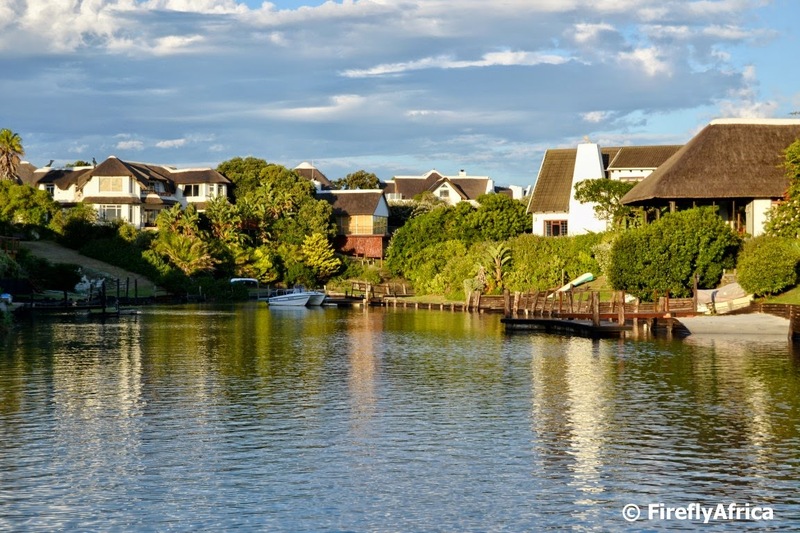 When you think of St Francis Bay in the Eastern Cape, the first thing that comes to mind are the beautiful canal system with its upmarket black and white homes lining the waterways. You can drive through the area to admire its beauty but the best way to really take it in is on a canal cruise. Our recent weekend in St Francis saw us join Brian Cunningham of Brisan on the Canals and a bunch of ladies on their last leg of the Chokka Trail for a canal cruise on the Swan of Brisan. The one hour long cruise took us up and down the canals which was first dredged by Leighton Hulett in 1967. As I mentioned before, all the houses are white walled and black roofed (with quite a few of them being thatched) as this conformed building style was insisted on by Hulett who originally owned the farm on which St Francis Bay developed. Brian pointed out interesting facts along the canals while there were gasps from everybody when he told us about the devastation of the huge fire that burned down 76 houses in 2012. The vastness of the event only really comes home when you see the area first hand. Just before sunset we cruised out onto the Krom River to see the sun set over the Kouga Mountains with a drink in hand (that's us having the drink in hand and not the sunset) before heading back to the guesthouse to disembark. I can truly say that you haven't experienced and seen St Francis Bay until you haven't been on a cruise as the best part of the canals can't be seen from the road. Just another reason to come and #ExperienceEastCape. Disclosure: We enjoyed the cruise as guests of Brisan on the Canals. I received no further remuneration, wasn't asked to write a positive post and keep full editorial control. Spending the weekend in St Francis a couple of weeks ago I was looking out a window after breakfast when I saw something drop from the tree down onto the paving. I quickly stepped right up to the window for a closer look and spotted a boomslang slither along the wall. I quickly grabbed my camera and ran outside just in tome to see him disappear into the shrubs in the flower bed. I got the long lens onto the camera (yes my new camera) and snapped this pic of him through the garden. By then a couple of other guests had joined me with cameras and he even had a GoPro on a stick stuck in there for a bit of video. We could see he was getting anxious so we gave him some space to get out of the corner and he quickly made his way up the tree on the other side of the paving. There he disappeared and only after a while did somebody spot him right at the top of the tree where I got the two photos above and below. What an awesome sighting!!! 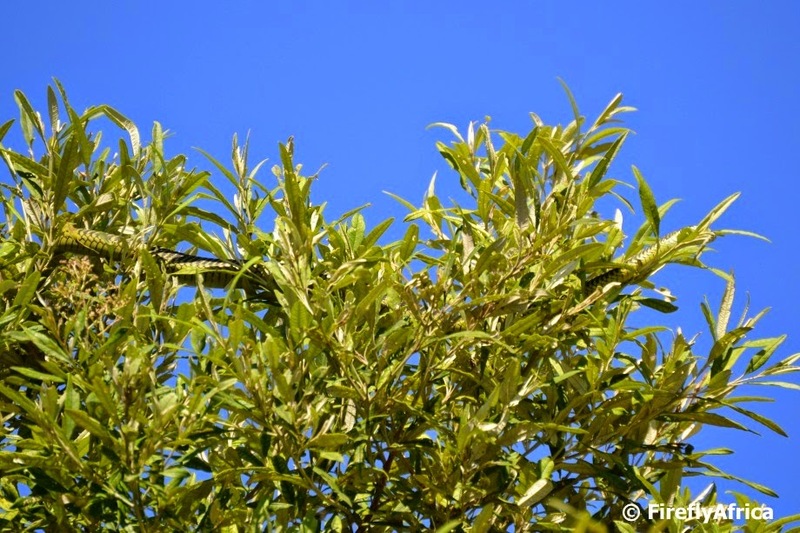 The average adult Boomslang (or tree snake) - Dispholidus typus - is around 100 – 160 cm in length but can exceed 183 cm (6 feet). Males are light green with black or blue scale edges (like this one) while the adult females may be brown. The Boomslang has a highly potent venom (hemotoxic) that gets delivered through large fangs that are located in the back of the jaw. They are able to open their jaws up to 170 degrees when biting. 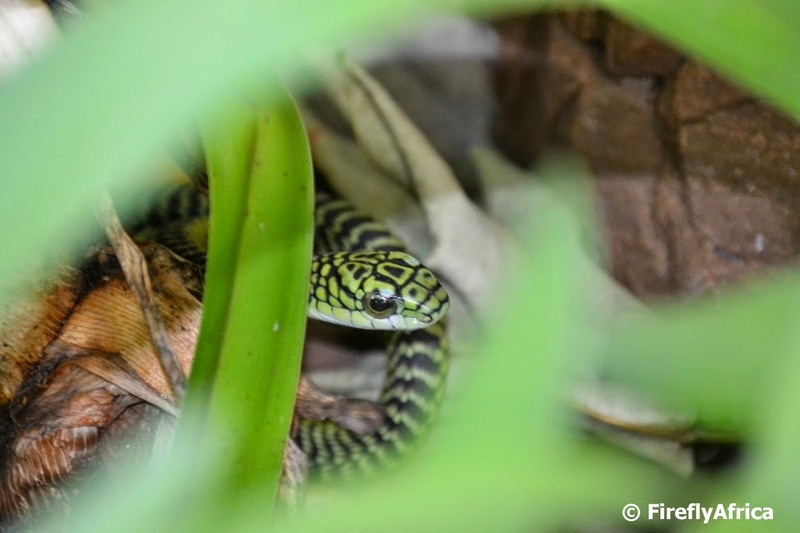 It is generally a timid snake and bites generally occur only when people attempt to handle, catch or kill the animal so it is unlikely to be a significant source of human fatalities. 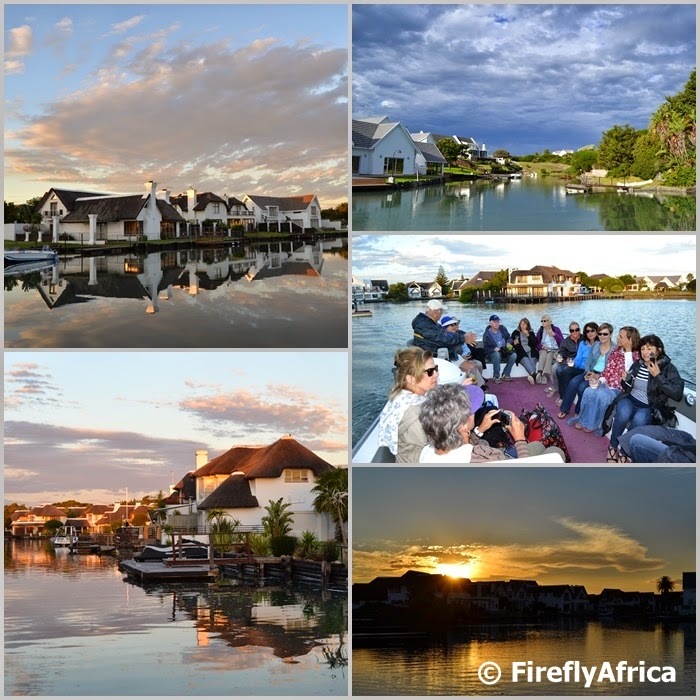 St Francis Bay, a tranquil canal area in the Kouga region of the Eastern Cape, home to beautiful homes, restaurants and relaxing boat trips... and lots of sunshine. The Seal Point Nature Reserve in Cape St Francis is home to the SANCCOB penguin sanctuary which is situated right next to the historic Seal Point Lighthouse. 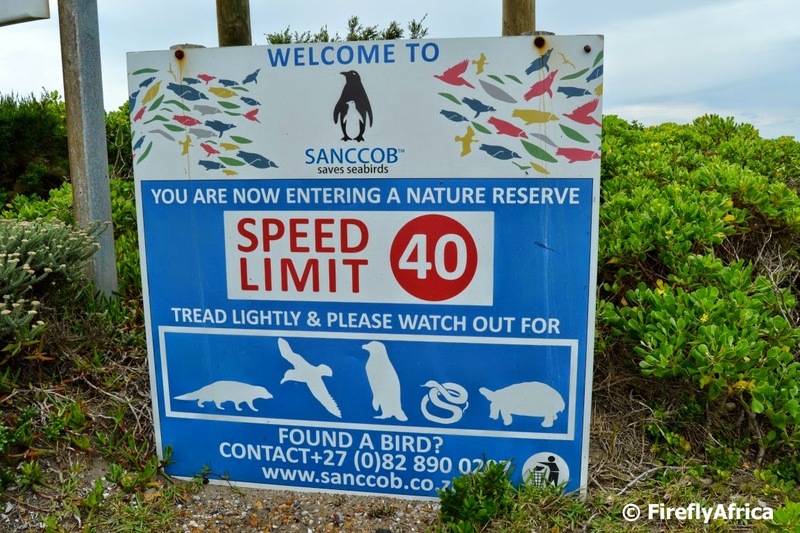 From St Francis Way there is a short road that takes visitors to the lighthouse and SANCCOB centre and it is at this intersection that SANCCOB has erected this very interesting warning sign. Can you name the animals you have to watch out for as you drive into and walk around the reserve? 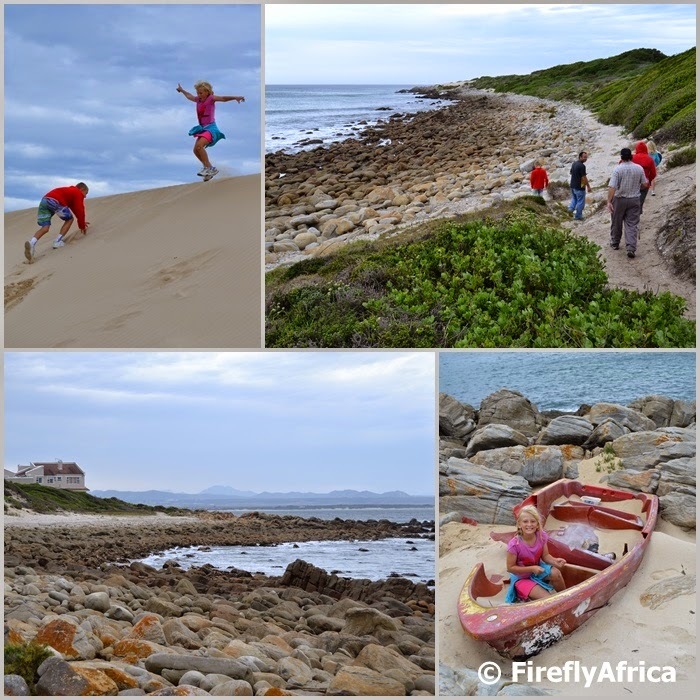 The St Francis Bay / Cape St Francis area has a number of hiking options and with such a stunning coastline how can it not? Most of the walks are shorter hikes and include coastal walks like the Blowhole Walk, Bay to Bay Walk, Shark Point Walk, Wild Side Meander and the Two Harbours Walk. There are also walks through the Irma Booysen Flower Reserve and up into the dune fields at the Sand River. If you really want to experience the best hikes the area has to offer then the four day slack packing Chokka Trail is just for you. We unfortunately only had one full day during our St Francis breakaway weekend so decided on two of the shorter walks. The weather on the Saturday morning was cool which meant perfect conditions for a walk. Our first walk was along the Blowhole Trail which was a nice and easy 5km return trip. As we were about the set off from the parking lot at Cape St Francis' Wild Side, another car pulled up and hooted at us. Turned out to be a couple of Geocachers from Port Elizabeth spending the day doing caches in the area and also on their way to the blowhole to do the cache over there. Suddenly our little part of four became a party of seven with two Jack Russells. The trail is a nice and easy one with beautiful views of the rugged coastline and surrounding Fynbos. On the way we passed the wreck of "The Osprey". Not that there is much left of this wreck dating back to 1867. Most of the ship was built of wood which means that it has all but disappeared. All that remains are a couple of small twisted pieces of metal. It seemed that the ship just steamed straight into the land with no attempt to stop. One sailor died in the wreck. The Captain, Navigation Officer and another Lieutenant were all court-marshalled. A short distance later we got to ground zero and the geocache (called Blowhole) was quickly found and the log signed by everybody. But where is the actual blowhole and why couldn't we see it? We fanned out over the rocks and it wasn't long before one of our party spotted it. A hole in the rocks connected to an cave underneath. Problem was out timing sucked and it was low tide. Darn! At high tide the water washes into the cave and gets forced up through the hole with a bang. Apparently quite impressive if the sea is quite high... which it obviously wasn't today. Oh well, we'll have to come back at some other stage to come and experience it. For our second walk we decided on the one to Shark Point. The deciding factor? Another Geocache of cause. We decided not to make a too long a walk and approached it from a parking spot at the end of St Francis Drive as you come from the St Francis Bay side. Other spots to start from is Port St Francis or the Cape St Francis side. We went for the shortest walk we could find which meant about 2 km return. This time our view was into St Francis Bay itself with the village of St Francis Bay, Paradise Beach and, further away, Jeffreys Bay visible. The coastline was also slightly different from the rugged coast on the other side with more boulders than actual rocks. Shark Point is the second point you find as you come into St Francis Bay from the west. The main point where you will find the lighthouse is Seal Point and it was this second point that led to the demise of the Genesis, a racing yacht that ran aground here in 1994. The shattered mid section of the hull can still be seen at the point. At our turning point we found what we were looking for. 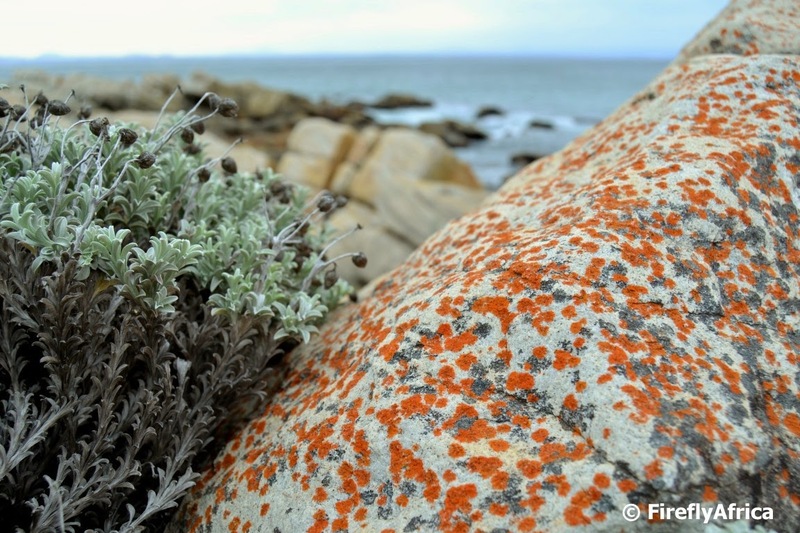 The oldest active Geocache in the Eastern Cape, Port Elizabeth - St Francis, placed in 2001. 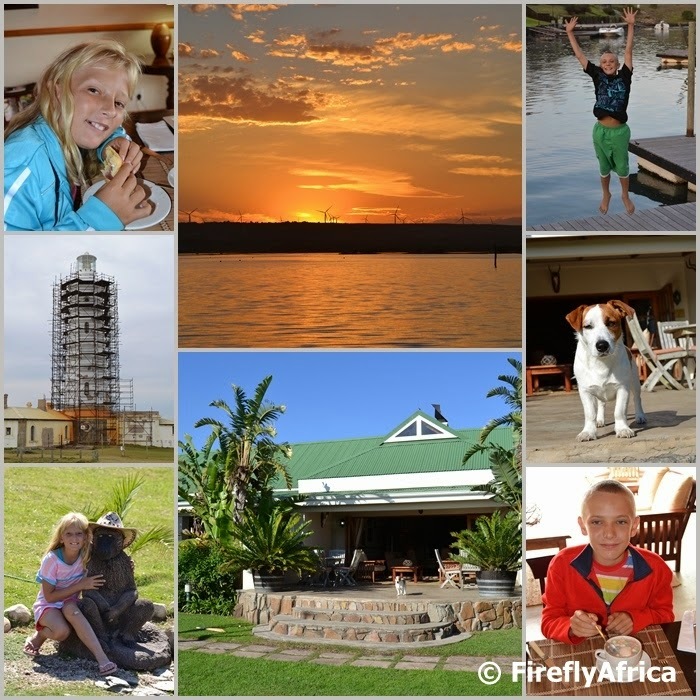 St Francis Bay is the perfect destination for somebody who loves the ocean, loves exploring the coastline and loves walking and going on short hikes. Do make a plan to visit and #ExperienceEastCape. 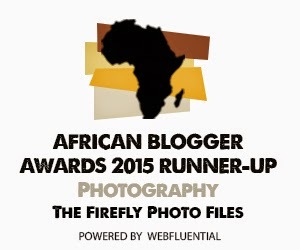 Our weekend in St Francis Bay gave me the perfect material for a Random.... post. This time random shades of grey and orange. 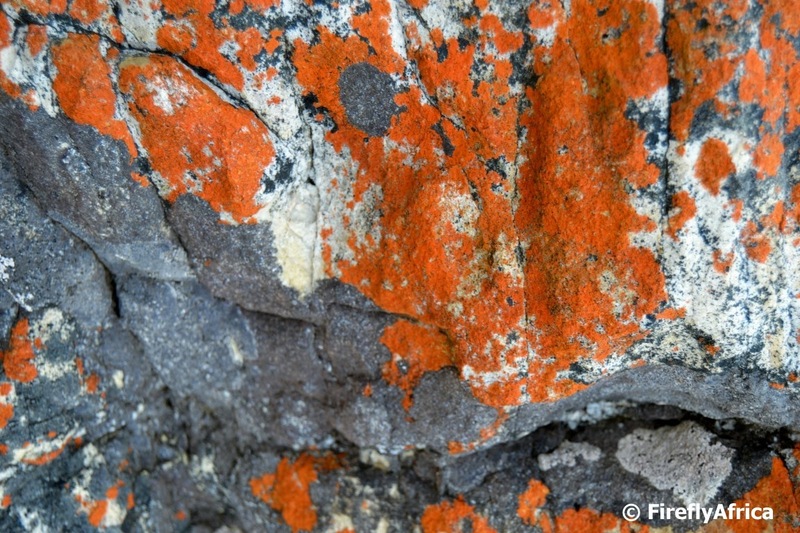 Orange, grey and white flowing together on the rocks along Cape St Francis' Wild Side on the walk to the blow hole. 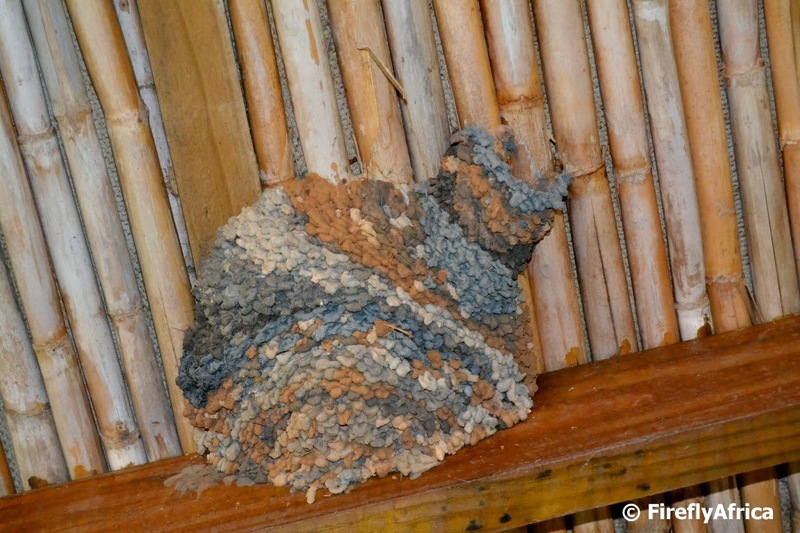 Check out the different colours of clay used by this swallow in building its nest on the porch at Dune Ridge Country House. Now this is the real 50 shades of grey. I snapped this pic during a canal cruise at St Francis Bay a week or two ago. 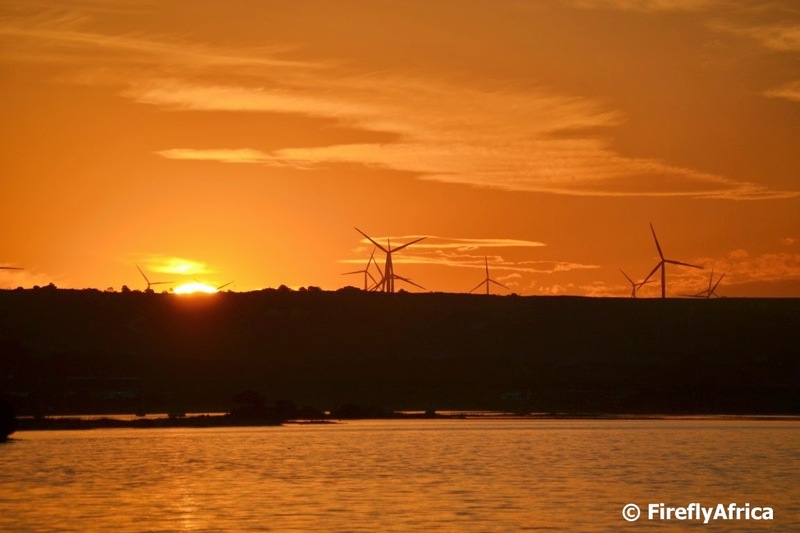 During the trip we cruised out onto the Krom River as the sun was setting in the west behind the Kouga Wind Farm. Have I mentioned how much I love my new camera? 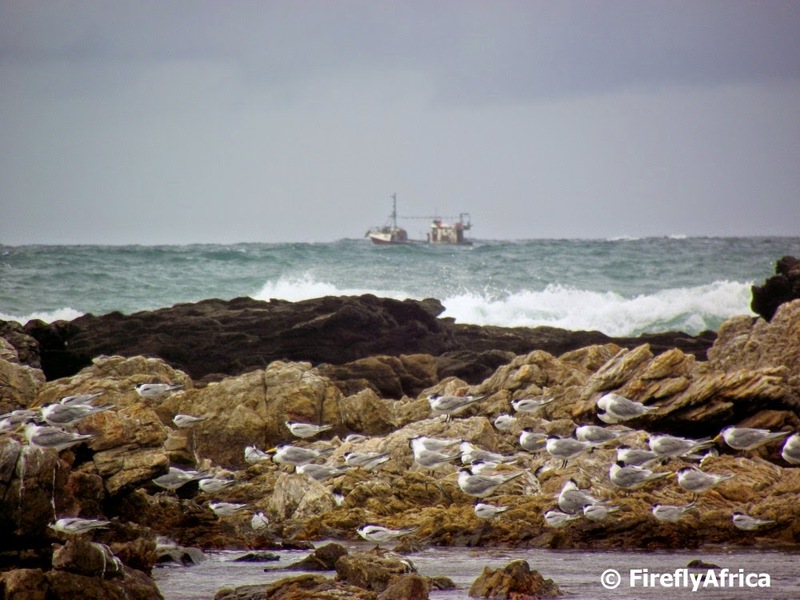 A fishing boat sailing along Port Elizabeth's Wildside with a flock of terns on the rocks in the foreground. This is the last picture I have to post taken with my Fiji bridge camera. The camera was in the boot of my car that was stolen about two months ago. The good news is that, after what felt like forever, the insurance finally paid out. I started shopping for a new camera (not that there is much available in that price range) and the Damselfly told me to think of myself for a change, pay in a bit and get a DSLR. It means I have a new toy. A brand new Nikon D3100. I know it's an entry level DSLR but it does mean that I can now finally take my photography up a step. Watch this space. We are very fortunate here in Port Elizabeth that we have a number of excellent destinations surrounding us. This does mean that it isn't always that easy to decide where to go for that much needed weekend break with your loved ones. Seeing that we can't get away over Easter this year, we decided to have a family weekend away a week or so earlier. 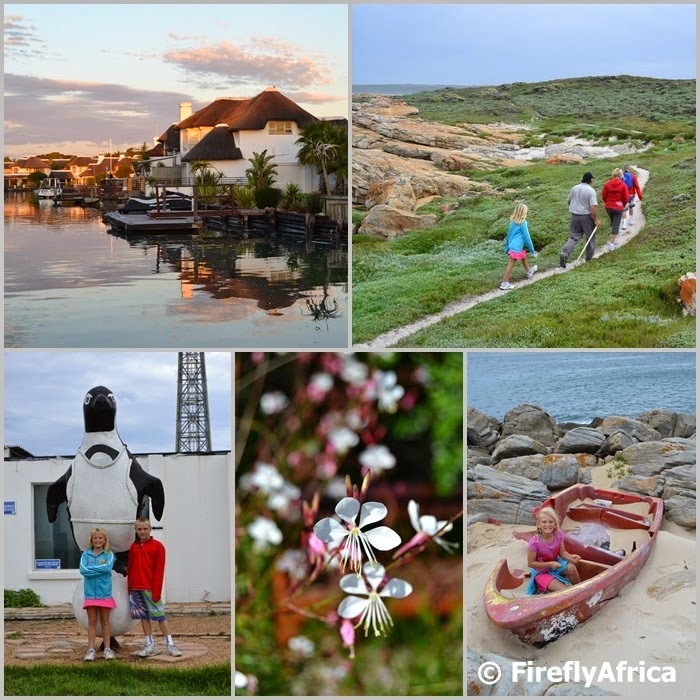 After much deliberation along with outside encouragement and a couple of invitations to visit, we decided to spend the weekend in St Francis Bay, throwing anchor at Dune Ridge Country House﻿. Dune Ridge an award winning four star Country House nestled between thick coastal fynbos and located just outside St Francis Bay. It is actually perfectly located to give that "away from everything" feel while still being close enough to easily explore the nearby St Francis Bay and Cape St Francis. After a warm welcome by Sarah Swanepoel and her team, we settled in and explored the property a bit before a drive into St Francis to grab dinner. Dune Ridge is a mixture of colonial nostalgia and modern sophistication. When one thinks St Francis you think canals and coastline. Dune Ridge isn't quite that. Its location rather lends to a bush and beach feel than just a coastal holiday With six double rooms and a family unit it's also not big and crowded like a hotel and gives you more than enough privacy to relax in. Saturday morning was a nice cool one so we decided to start the day off in Cape St Francis after breakfast and go for a walk. A quick bit of research showed two possibilities, both with Geocaches for us to find. You know me, a possible Geocache find is always a game breaker. We decided to do both. Heck, we're here so why not? The first walk was along the rugged coastline going westward from the village towards the blowhole. The 2,5 km walk took us past the wreck of "The Osprey". Not that there is much left of it. The ship, which wrecked here in 1867, was built of wood and all that remains are small twisted hunks of metal. The blowhole itself is apparently impressive at high tide when the water rushes in through the cave and blows up through the hole in the rocks. We unfortunately didn't check the tides and ended up there at low tide. Bah humbug. Will have to return some other time to see it perform for us. 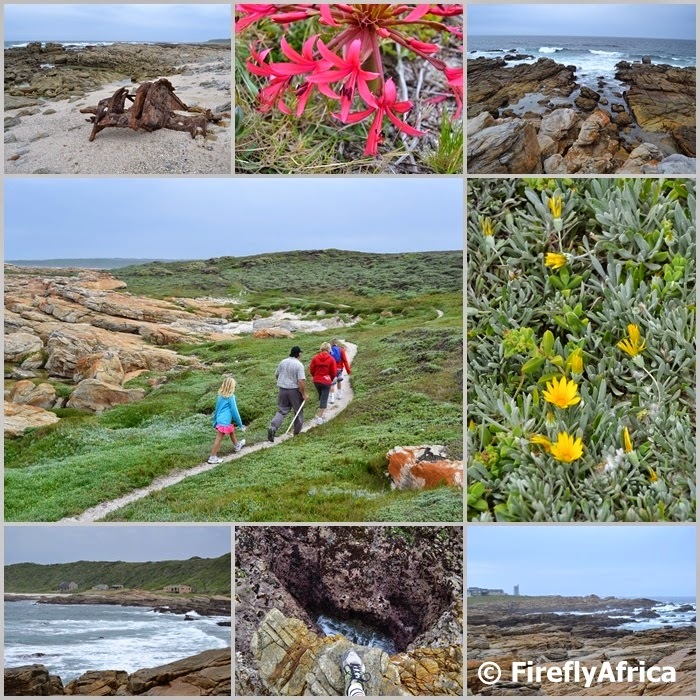 The walk was still more than worth it with stunning coastal beautiful fynbos and lots of little flowers, especially the bright pink Candelabra flowers blooming at the moment. Before the next walk we swung past the historic Seal Point Lighthouse and adjacent penguin sanctuary for a quick look around. Renovations to the lighthouse is coming along very nicely and it will hopefully be open to the public again some time soon. The SANCCOB penguin sanctuary offers tours around the facility to show visitors the awesome job they are doing in the African Penguin's battle for continued survival. Our second walk was from the Port St Francis side to Shark Point, the easterly of the two points in the area, the other being Seal Point where the lighthouse is situated. The cache we found near the point turned out to be the oldest active Geocache in the Eastern Cape. Nice to get that ticked off my list. The views on this side of the coastline is slightly different from the first walk as you look into St Francis Bay itself with mountains on the horizon across the bay and the houses along the coast in the distance. Late afternoon we headed to Brisan on the Canals in St Francis Bay for a cruise on the canals. 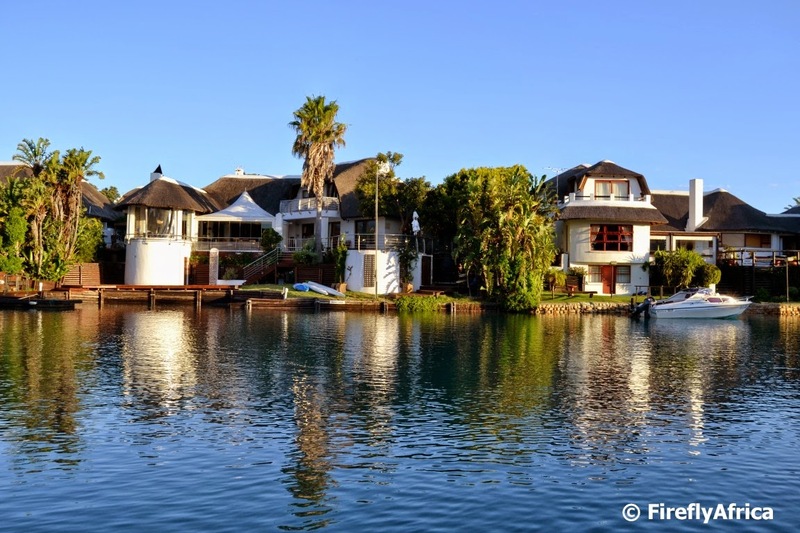 The canals with their black and white houses are stunning and if feels like you are in a different world yet it's right here in the Eastern Cape. (And here I can't help but to use my #experienceeastcape hashtag) Other than just showing us the appeal of the area, owner and skipper Brian Cunningham was telling us about the huge fire that destroyed over 70 houses in 2012 and pointed out how many of them have been replaced, built bigger and better than before. During the one hour tour we made our way out onto the Krom River and as we cruised along with a glass of wine in hand (cold drinks in the case of the KidZ) the sun set in the west behind us. The perfect end to a choc and bloc day of exploring. Sunday morning after breakfast we decided not to go out and spent some time next to Dune Ridge's welcoming swimming pool. After checking out we opted for a bit of a detour via Jeffreys Bay rather than heading straight back to PE and ended up on the beach at Aston Bay close to Marina Martinique. Oi, if only we had more time but this part of the Kouga will have to wait for another visit. 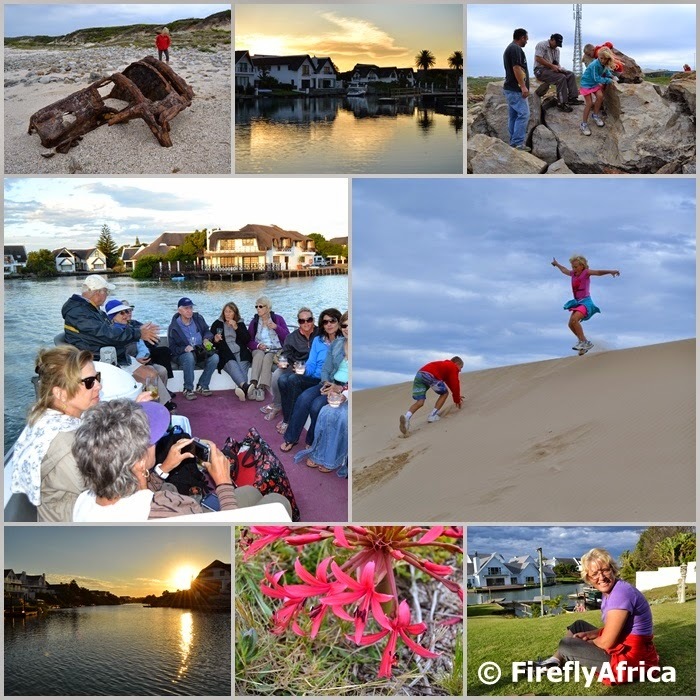 Disclosure: We enjoyed the visit as guests of Dune Ridge Country House, Brisan on the Canals and Kouga Baviaans Surf and Safari Country. I received no further remuneration, wasn't asked to write a positive post and keep full editorial control.